Our visit to Utah was Autumn's first plane ride - she did amazing! I on the other hand... I am a veteran traveler and up until 2.5 years ago I was flying about every 6 months. Since then I've gotten rusty and let my fears of terrorism/planes breaking/life ending in a horrible way paranoia get to me. Autumn was a great distraction from all of that and once we made it to the airport and were waiting to board, I was fine. My parents dropped the three of us off and it was an emotional goodbye for my Dad. Sure, he leaves all the time for a week on business, but it was different this time around. It was very sad to see tears fall down his face as he handed Autumn over to us so that we could walk through security. 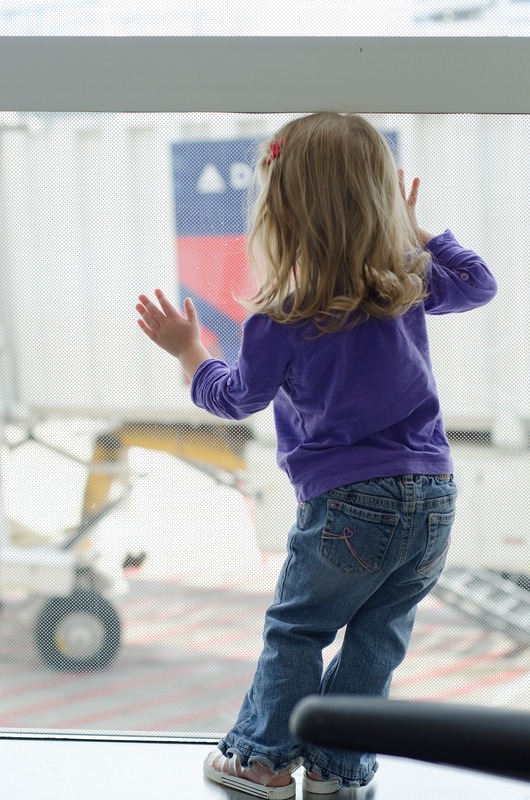 The bonus to traveling with a child? We got to board first! The first flight we were lucky in that there were a few empty seats in front of us and I asked the woman sitting between Adam and I if "she wouldn't be more comfortable in the exit row in front of us". She moved, and despite having her own seat, Autumn insisted on sitting on my lap for most of the flight anyways. Oh well! It was sweet because on the first flight to Minneapolis we were in the back of the plane surrounded by a group of Asian tourists or some group. We didn't understand them as English was not their native language, but they were all completely enamored with Autumn. They were all cracking up over her and were really sweet to her as we waiting to deboard the plan. They were great company on our flight! We had to run to our connection, but we made it! Thank goodness we brought our umbrella stroller. Autumn sat on my lap the entire time as we weren't lucky this go around with an empty seat. Still, I had followed the advice of some friends and hit the dollar store before our flight and just kept pulling more tricks out of my bag. She only slept for the last 15 minutes of the first flight in my lap, but she was a trooper and kept going all day. Ernie also experienced his first flight, as did Autumn's mini pillow pet, "Piggy"
The flight home we now knew what to expect with Autumn (and I now had in my possession Xanax) so it was much more relaxed and less stressful. Despite leaving for the airport at 6:30AM, we were all happy campers and were eager to get back home to family and our own bed! Because our first flight was so early and we'd been moving around so much, Autumn and I both snuggled and slept for the first 45 minutes of the first flight. Our middle seat mate didn't switch with Adam and couldn't move because of a full flight, but he was patient with Autumn and very easy going. Our layover was in Detroit this time, which made the flight a little over 2.5 hours vs. 2 on our way out west. Still, Autumn was a champ! We had a good thing going on the first flight of our trip home. The WiFi was down, so I think we were given the TV free for the flight, which was great since it was the longest leg. The TV's were right on the seat, so I could watch my shows while Autumn watched her SpongeBob and Dora episodes on the iPad. It was the most still she sat for the longest period of time - she loved her snacks and thought the drinks brought to us were neato. The flight from Detroit to D.C. was considerably short. We had just enough time to buy lunch, but had to eat it on the plane. This time around the plane was only 4 seats across, 2 and 2. With the armrest up between Adam and I, Autumn was a perfect fit. It was probably the most comfortable we were of all the legs, even with an empty seat at one point! After almost 3 hours of her being confined on my lap, I was glad when she was willing to sit with Adam. She slept almost the entire flight and it was a nice break and the most I got to relax on all of our flights. When we got home to my parents house for a quick stop and dinner, my sisters boys who were also visiting ran out onto the front lawn to greet us. Autumn started shrieking in the car and was so excited to see her cousins! She didn't know what to do with herself when she finally got out of the car and had the boys and my mom in close proximity again. Overall, the flights were a success. I am not looking forward to doing it ever again, but that's just because I am a horrible traveler with my stomach issues and anxiety. 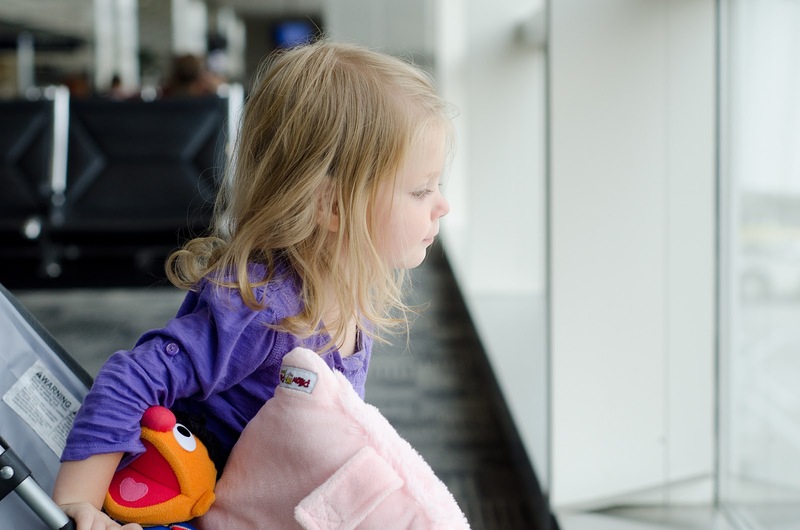 I am so glad Autumn takes after her Dad when it comes to traveling! I was so proud of my little girl and now she can officially say in regards to planes - been there, done that. More to come from our trip! Aw!! Love all the pictures! She is a doll and I'm always a sucker for loving the sleeping pictures. And the excited one with her Dad and the reunited one with Grandpa are just precious. SOO awesome that you live so close to your parents. And I'm glad the trip went okay!